Bloodline delves into the difficult family history of the work of Radha Marcum’s grandfather on the Manhattan Project, building the first atomic bombs in Los Alamos, New Mexico, during World War II—and how that both brave and heavy legacy has affected the women in her family, both then and now. The poems trace trajectories irrevocably altered by Los Alamos and its history and the ambiguity of being a part of that story. They also traverse wide, wild spaces where remnants of past cultures and threads of current events intersect. 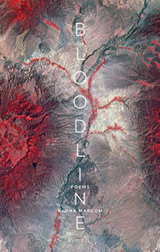 In that sense, Bloodline is as much about the landscape of the American West, a collection of poems shaped by geology and ecology, as it is about personal and cultural histories and the Manhattan Project. Through observing the magnificent natural features and scarcity of water in the West, Marcum has sought to dig deeper into metaphorical landscapes. Canyons, creeks, and rivers are the lifeblood of our civilization, one that has grown to create apocalyptic technology. In these bloodlines, there is a deep connection to our ancestors, as well as the unpredictable paths of our own lives and how we shape future generations. And yet, the most important bloodline here is a personal one—a voice in wilderness that seeks for that which has carved its song. Some stories have long half-lives. Radha Marcum’s beautiful first collection of poems, Bloodline, describes the personal impact of her grandfather’s participation in the Manhattan Project. Bloodline is both elegy and reconciliation. Like the ghosts diving for bells throughout this work, there is a deeply haunting quality to Marcum’s poetry—(you’ll remember this)/like dust from a blanket. Or—All afternoon the heart/drops notches/blue and then bluer. And always, underneath—the field undresses so slowly—the Rocky Mountain West is solace and frame and crucial. Her landscape is closely and truly observed, resonant with meaning—The canyon’s throat/stays open and silent, except—/snip snip—a birdcall like scissors/cutting and cutting. Line by line, Marcum cuts her own way toward understanding the deep story she is in, a story we all share. Bloodline is a mesmerizing, intelligent book, full of beauty, science, and ancestry. I love how it subtly weaves the threads of physics, nature, atomic destruction, and family into poems of great music and power. The figure of the grandfather—a physicist working on the Manhattan Project in a desert of blinding light and heat—is perfectly contrasted by the grandmother’s world, a weightier mass of dark rooms and arid gardens. It’s this contrast that brings the granddaughter’s voice—and poetry—into the world. A poetry where one finds a comforting solitude out in nature. These are poems that I won’t forget for some time. A poet with a keen interest in both the landscape of the physical world and of the mind, Radha Marcum lives in Colorado where she has worked as a journalist and editor. Marcum received an MFA from the University of Washington where she won the Klepser Fellowship in Poetry. She has taught literature and creative writing in Seattle, Washington; Boulder, Colorado; and Rome, Italy. Her poems have appeared in FIELD, West Branch, Pleiades, Gulf Coast, Chelsea, The Bellingham Review, Poetry Northwest, and Taos Journal of International Poetry and Art, among others. Bloodline is her first book of poems.